Local radio with a bite! 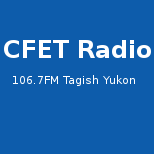 Our community operated radio station serves the semi remote village of Haines Junction, Yukon. We are always seeking to improve our programming to better reflect our community's needs and provide the widest range of programming we can. For this we need you. As a community radio station the most important part of our broadcasting is our volunteers. And you could join us with your very own radio show. Getting involved is very easy and we are happy to help you get your show on the air. Share your music, stories, poetry, your favourite activities, or anything you feel passionate about, over the air, for your friends and neighbours to listen to. To get the ball rolling just contact Dieter, our station manager, at grizradiofm@gmail.com and he will be happy to explain how simple it is.